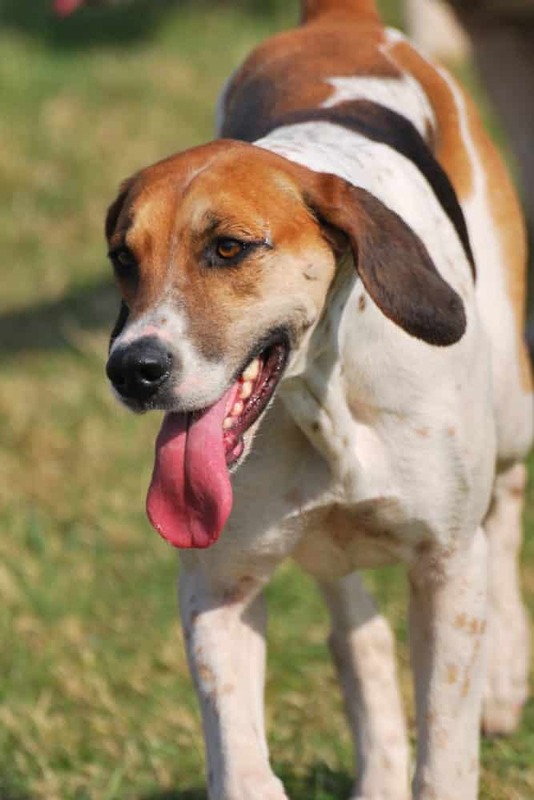 Like the American Foxhound, the English Foxhound temperament is typical of pack hounds. This means that he enjoys being part of a pack, whether it's with other dogs or humans. The English Foxhound is the American Foxhound's cousin. They are both scent hound dogs, meaning they hunt foxes by scent. The English Foxhound's history is both odd and interesting. The English created the breed during the 16th century in response to a perceived deer shortage. Under Henry VIII's reign, the nobility hunted deer for both sport and food. Convinced that the deer had run out and they needed a new target, they chose the fox. And for a new target, they needed a new hunter. The Greyhound, Fox Terrier, and Bulldog were then mixed together to create the English Foxhound. They chose the Greyhound for its speed, the Fox Terrier for its hunting instinct, and the Bulldog for its persistence. Sociable – Passing someone on a walk? The English Foxhound is a social butterfly who has no trouble saying hi. Companionable – He is open to the idea of making friends. After all, they can be members of his pack! Gentle – Because he is so gentle, the English Foxhound makes a perfect family dog. Tolerant – He can tolerate everything from long walks to the roughness that sometimes comes from playing with younger children. Active – Don't be shy about exercising him – the more activity, the better. Independent – Like other hound dogs, the English Foxhound enjoys marching to the beat of his own drum. The English Foxhound temperament makes him quite the lovable dog. He’s a friendly dog but, like any dog, he requires early socialization to help him reach his friendliness potential. To socialize him, walk him to stores that allow dogs, like Petco. Walks around the neighborhood can help him meet his neighbors, and having frequent visitors helps too. He enjoys his bark, which may make him sound like a great watchdog. However, he isn’t much of a guard dog as he isn’t all that protective by nature. He is great with children, but supervise younger children to make sure they aren’t getting carried away in their playing. And while he does love kids, his pack mentality makes him interested in being around other dogs more. Therefore, if you already have a dog, and you’re looking for a companion for him, this is the perfect dog. If you already have more than one dog, even better. He’ll fit right in with the pack. 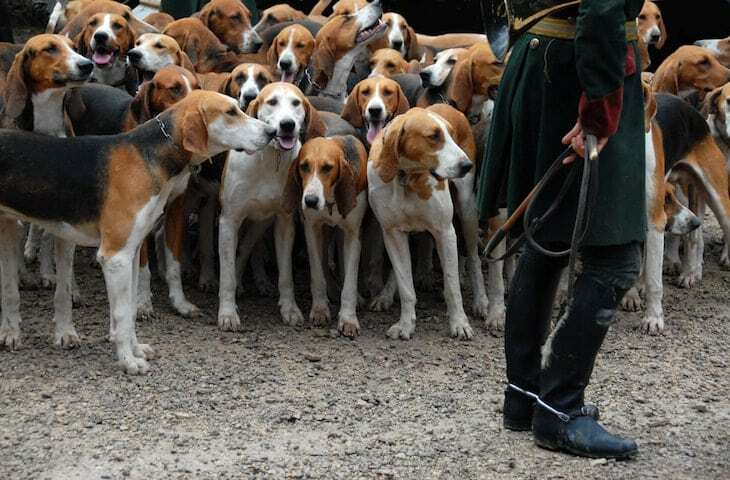 The English Foxhound’s passion for the hunt can keep him going for hours. You may find that you tire from a walk long before he does. In fact, he has no problem being out all day hunting, then playing for a few hours with the kids at home. Due to their independent streak, English Foxhounds can be as stubborn as their hound cousins during training. You should train an English Foxhound puppy as early as possible. Training should be consistent, and you must establish the pack order early on. Once he understands that you're his pack leader, he will be obedient. In order to convince him of that fact, you must be calm and loving, but also firm when necessary. It is super easy to groom English Fox Hounds. Their coats are short and coarse, so you only need to perform minimal maintenance. You should only brush them once a week to keep him looking healthy. Even baths can be occasional – usually only when he starts to get that stinky, wet dog-like odor. Also, just like all dogs with droopy ears, make sure you check and clean his ears regularly. If his ears develop a build-up, it can lead to an ear infection, and neither you nor he wants that. The English Foxhound temperament calls for exercise. If he does not get enough exercise, he can become anxious or distant, or assert his dominance. An English Foxhound who receives proper exercise will be obedient, sociable, and good-natured. He can run for miles, making him a great running or hiking companion. Multiple brisk walks each day should help keep his energy level down. If you’re not very active, this is not the right dog for you. Bonus points for if you like to hunt. This dog will be your right-hand man. If you live in an apartment, this may not be the right dog for you. This is because he likes big backyards where he can run free. You must always keep this dog on a leash. Remember, he is a scent hound, so if he picks up a scent that he wants to follow, he will. And he can follow that scent for miles, becoming fixated on it for hours. Warning: if you do not use him as a hunting dog, he will find a way to channel that interest elsewhere. The average lifespan of a healthy English Foxhound is between 10 and 13 years. As with all breeds, there are certain health problems that can affect the English Foxhound. Hip dysplasia – A very common health condition wherein the dog is born with a malformed hip socket. This can lead to arthritis in the dog’s later years. Epilepsy – Dogs who suffer from epilepsy develop seizures of unknown cause. It can sometimes be a product of another condition, such as kidney failure or liver disease. The English Foxhound is pretty lucky, as most of these conditions are rare. All told, the English Foxhound is a healthier dog than some of the other breeds out there. The average English Foxhound cost lies in the range of $800 to $1,200. The English Foxhound price is reasonable when compared to the price tag of other breeds. Foxhound Rescue is incredibly helpful if you’re interested in adopting a rescue dog. They have a map right on their front page with the number of adoptable English Foxhounds available in each state! Clicking on your state brings you to the information for each dog, including their pictures and exact locations. Adopting a dog is often cheaper than buying one from a breeder. Therefore, because this is a breed that does well with other dogs, you may want to adopt two at once. Not only is it cheaper, but this ensures that you won’t have one lonely dog without his pack. English Foxhound pups are available from a multitude of breeders. If you’re interested in purchasing an English Foxhound puppy, be sure to research breeders before you buy. This is to ensure that you’re not paying top-dollar for a dog that may have health issues. If you'd like to see English Foxhound puppies and adults in action, you can attend one of the events hosted by the English Foxhound Club of America. The English Foxhound temperament makes him a joy to be around. He is sociable and friendly, great with kids, and loves to exercise. He does much better in a spacious backyard than confinement in a small apartment. And lastly, the English Fox Hound is one of the healthier breeds out there, as the conditions that affect this breed are rare.